Last week Drew had a meeting up in Washington DC. So, we all decided to go and take advantage of being able to spend some time in our nations capital. The kids and I did a lot of walking in the morning and early afternoon and when Drew was done with his meeting he met us and we finished looking at the sights. It was a very long day, but well worth. The pictures are from our trip. Yes, we were just like all of the other tourists there taking pictures, but we had a great time, and I think the kids will remember it for a long time to come. I know I will. 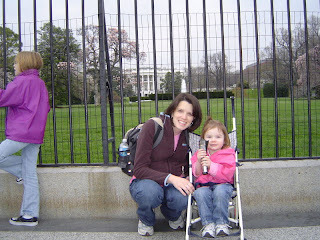 K and I in front of the white house. This is as close as you can get in real life. 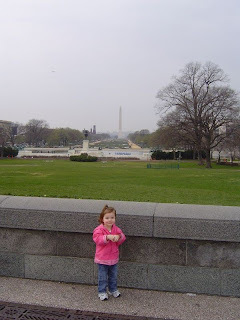 K on the steps of the Capitol Building looking toward the Washington Monument. 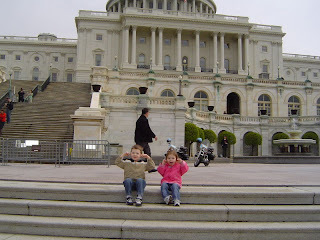 C and K decided to make funny faces on the Capitol steps. We rode the Carousel in the middle of the mall. The kids insisted on sitting in the cup, so we did. 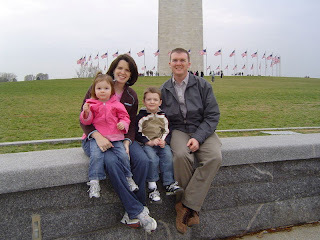 All of us in front of the Washington Monument. C on the steps of the Licoln Memorial. 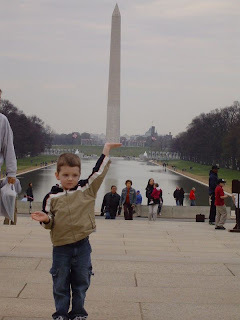 He's holding up the Washington Monument. I can't believe how strong he's getting! 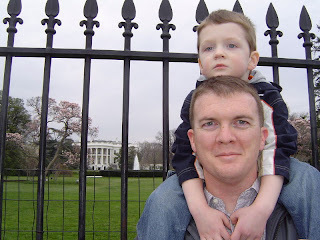 C and Drew in front of the White house. C was so tired at this point we had walked about 5 miles and still had about another one or two to go to get back to the car. He was such a trooper with all of the walking we did that day. Since we are in Virginia, we are trying to take advantage of some of the local attractions. One of the museums, the Virginia Air and Space Center was having a special for military families on their admission, so today I took the kids to see what all they had to offer. The kids had an amazing time. C and K are both flying an airplane. K is taking a 39 day trip to Texas to see Grandma and Grandpa. There were a lot of flight simulators for the kids to sit and try out. They didn't want to leave. Cs favorite part was the mission to Mars. We took a space shuttle trip to Mars and when we got out, we were really there. It took 180 days to get there. Good thing it was super fast! K's favorite part was the candy exhibit. It told all about how candy was made and the history of candy, from the cocoa bean to todays crazy candies. We were fortunate enough to travel to Virginia to be able to spend some time with Drew for Easter weekend (and then some). Because we were so close, we drove to Richmond after church on Sunday and spent the afternoon and evening with Grandad and Nonnie. They had an egg hunt for the kids and a wonderful dinner for all of us. It was a great time. C couldn't stop talking about how much fun the 'Easter Hunt' was. Sorry the pictures are kind of out of order. Aunt Amy helps the kids look for more eggs. Aunt Amy helps C open all his eggs after the hunt was over. The kids are snacking on popcorn and milk before dinner. Drew and the kids are all ready for church. Drew and C got maatching ties and K has a new Easter dress. K got Bunny ears from the Easter Bunny in her basket. C is on the hunt for more eggs. C and L are eyeing the same eggs. It started snowing here yesterday morning, and it hasn't stopped. It hasn't been really big flakes, its just a non-stop snow. As of right now we have received about 10 inches and its still coming down. We are in a blizzard warning until later this afternoon, and the wind will just not let up. It leaves for some interesting patterns in the snow. This morning, the kids and I went out for a little while, as long as they could handle it. I think they love to play in the snow, they just don't like it being so cold. Here are some pictures that I took from our backyard. C got stuck in waist deep (for him) snow out by the fence. K fell by the steps and couldn't get up. The kids, along with Jared, our neighbor wanted to go down the slide. Notice the snow up to K's bum. It was that way in most of the yard. There were parts that came all the way to my waist, due to the wind blowing it around so much. We came inside to have hot chocolate and warm up by the fire. The kids could only stand to be outside for about 30 minutes. Honestly, I can't blame them. Between the snow and the wind, it was pretty cold out there. After we came inside, one of our neighbors, from our ward, came over and started shoveling our driveway. I feel so bad because the snow was so deep. But, I am grateful that I don't have to do it by myself 6 months pregnant. This is the front steps, after they had been shoveled. Ned shoveled half of the driveway, and 10 minutes later you can't even tell. Notice how tall the snow is piled next to the mailbox. This is the street next to our house. Its been plowed, about an hour earlier. Its hard to tell, but with the wind and snow continuing to fall, it all pretty much looks like this. 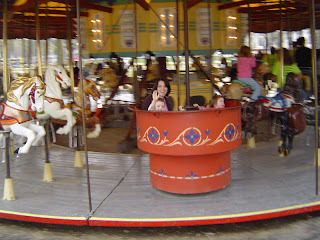 When we went to Virginia a few weeks ago to visit Daddy, he took all of us to the circus. We had such a good time. For those of you who haven't seen pictures, here are some of my favorites. They were both terrified of being next to a clown. This was before the show started, once we got to our seats and the show started, they were in heaven, enjoying every minute. Notice, I am laughing hysterically at their reactions. K is just dancing away to the music. She was enthralled the entire time. This is one of Drew's favorites. For Christmas, C got the Super Hero Starter Kit. It is a fun little book that tells all about how to be a Super Hero. It has stickers and a cape, and even gives tips on how to pick the best name. He has been begging me for months to do it, and it just seemed that we never really had enough time to do it justice. So, this week we finally got around to making C and K into Super Heroes. They even picked their own names. C is now "Wonder Donut" and K is "Super Noodle" They decided that Wonder Donut fights the bad guys by throwing donuts at them and distracting them from doing the bad things, after all, who can resist a good donut? And Super Noodle ties the bad guys up with noodles. A few weeks ago, the kids were talking about how they wanted to have a sleepover for bed that night. It was a week night and we all had to get up early in the morning, so I nixed the idea. Later that night, I went to check on C before I went to bed, and this is what I found. He found a way to have a sleepover on his own without K's help.